An abstract lacy flower at first glance... Look closer and you begin to see hearts within hearts! Five large hearts encircle a star. And Five more hearts lie within them. 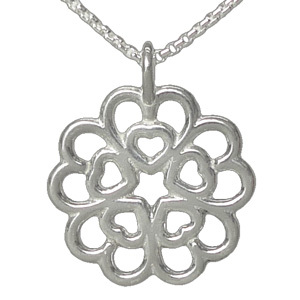 This unique Rosette pendant makes a lovely and meaningful gift... especially for a 10th Wedding Anniversary. But of course you don't really need a special occasion to buy it. This playful heart design is a subtle and unique piece of art, that can be worn anytime.